Left: Yanoda Tropical Rainforest is covered with a carpet of thick vegetation. Above: Visitors can enjoy a tropical country view from their rooms at Bulongsai Hotel. Hainan island is famous for its sun, sea and sand, but tourists looking for a warm winter getaway will be delighted to know that they can take in the fresh rainforest air and fall asleep to the soothing calls of frogs and crickets in the southernmost island province. Hainan’s Baoting Li and Miao autonomous county offers bucolic ethnic villages and resorts nestled amid verdant rice paddies, as a pleasant complement to the sunny beaches and blue waters of major tourist area Sanya. 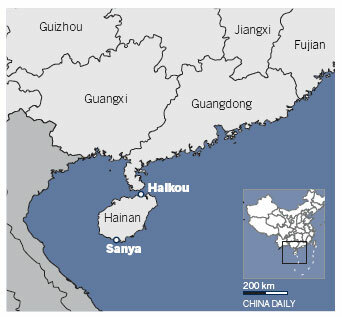 Located 35 kilometers from Sanya, all the five famous rainforests of Hainan are located here. Visitors will find themselves surrounded by broad-leaf tropical plants including banana and papaya. The rainforest boasts 140 kinds of South China medicinal plants, 80 kinds of tropical flowers and 30 kinds of tropical fruit. The Rainforest Valley is straight out of an ecological fairy tale, with lianas that extend about 100 meters long, clinging from one tree to another. Large banyan trees anchor onto the rocks to give tourists a pristine look at the lush treasures of a tropical rainforest. The valley is also covered with a carpet of various grass types that are crisscrossed by brooks and streams. Roads are mainly made up of wooden paths that are 1.2 km long. It takes visitors about 40 minutes to walk the whole way. Sandao Valley is famous for prominent rock features, cliffs that tower over two sides of forests and raging waterfalls that plunge down its hills. Sandao Canyon runs along a 3-km-long river that is more than 30 meters deep. Rock outcrops have been likened to lunar terrain and some even seem artificially smooth. The valley lies on the border of the city of Sanya and Baoting county and is about 28 km from Sanya. 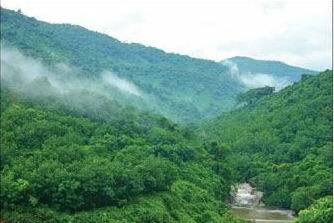 It gets it name from being formed by a valley covered with thousands of areca palms and dense jungle on both sides. From this reserve, people can experience the culture of two of China’s oldest minority groups, the Li and Miao. Tourists will be able to see the boat-shaped huts in traditional Li style. The hut is considered a unique construction because of a skillful combination of sea and mountain features. Visitors can have a close look at authentic Li body art, which can be found from the few old women living in the village, with many tattoos reflecting the experiences and lives of the wearers. Ancient, open granaries unique to the area similarly show the characteristics of a people whose possessions are seemingly free from theft or thievery. The granaries have no locks and point to the integrity of these people, who are known not to steal anything from any house. At Li village, tourists can also appreciate the ancient and highly advanced weaving devices displayed through textile craftsmanship. Other attractions include the Li people’s ancient musical instruments made of ox horns, logs, bamboo and coconut shells. The Miao people are the second-largest ethnic group in Hainan. When entering a Miao village, tourists find themselves visiting a tribe from ancient times. They will find the Miao living in small log cabins raised from the ground on the mountains. Miao girls wear pleated skirts and blouses with wide lapels, and large silver rings around their necks. Miao boys are known for being wild and daring, and can perform amazing stunts. This is a five-star hotel built on a rice paddy field, close to the Yanoda tropical rainforest and about 30 km from downtown Sanya. Visitors can enjoy a tropical country view from their own rooms, and local Li ethnic treats such as rice cooked in bamboo and homemade wine as well as farm-styled dishes that are green and organic provide satisfying sustenance. Fresh air and the simple country life complete the order of the day to help make any tropical sojourn here an original and natural experience.